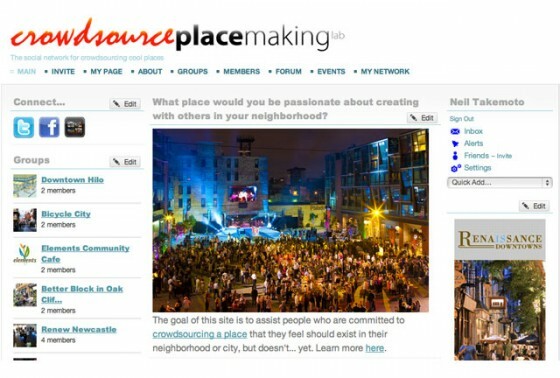 This is a site for defining, talking about and providing examples of crowdsourced placemaking, but what about actually doing crowdsourced placemaking? That’s what the Crowdsource Placemaking Lab is for. The purpose of the Crowdsource Placemaking Lab is to assist people who are committed to crowdsourcing a place that they feel should exist in their neighborhood or city, but doesn’t… yet. It’s a place for you to answer the question, What place would you be passionate about creating with others in your neighborhood? Create a new Group to define the kind of place you’d like to crowdsource in your neighborhood… A coffeehouse? A coworking site? A car-free neighborhood? You define the vision, then start attracting people to build up a crowd. It’s very important to note that the Lab team will even provide assistance (only through the site) for free. Why? Because this is a new field, and people need all the help they can get. What’s next? Once you build up a sizable crowd of at least a hundred people; a beta community, the Lab team will help you find a ‘sponsor’, that is, an investor willing to work with your group to implement your collective vision. Think of it as the crowdsourced placemaking challenge.